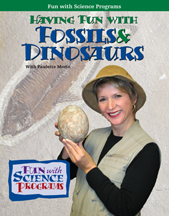 Dressed for digging, intrepid fossil hunter Paulette Morin introduces children to the wonders of dinosaurs and our prehistoric past. This presentation touches on the who, what, where and when of the dinosaurs. With more than 100 fossil specimens and our enthusiastic storytelling, your children will be sure to learn and have fun. 1.) Storytelling using a 5 foot tall storybook, music & more!